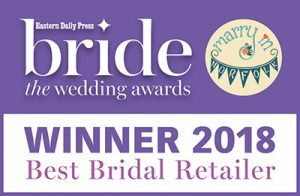 After visiting four other bridal shops in Essex I am so glad we made the journey to Norfolk to Le Jour Bridal. The shop is beautiful, there is an amazing selection of dresses, and Rie and Lauren are both so kind and approachable and made me feel completely relaxed and at ease. Most importantly they helped me find my dream dress! My name was written on a lovely chalkboard outside the door welcoming me to Le Jour. As soon as me and my mum walked it already felt like 'the place' Rie & Doris were so warming. We were offered cups of teas, with biscuits - yum! The whole experience was absolutely flawless. We browsed the dresses and picked out which ones I wanted to try on, Rie recommended a dress that I wouldn't of picked, it was the first dress I tried on and it was the one!!! I am so, so pleased and really felt like a princess! Doris was brilliant with the accessories as well! Thank you so much Le Jour!!! RECOMMEND RECOMMEND RECOMMEND!!! I felt relaxed and welcomed the moment I stepped through the door. Lauren and Rie were so welcoming and so helpful. The experience I had was so amazing. Didn't feel pushed or rushed in any way. The place is beautiful and luxurious. They both listened to me and helped me a lot.Thank you to you both for helping me find my wedding dress � will definitely recommend to everyone. Such a lovely shop. Brilliant service from the friendliest ladies. Also the most gorgeous dresses!! Le Jour Bridal Studio offers an exclusive and very special dress shopping experience, by far the best service I received and I would certainly recommend to others. My big day was on Saturday and I lost count of how many compliments I received on my dress, it was truly stunning! Thank you to Rie and Lauren for helping me find the perfect dress.